Apple on Monday announced it will reveal financial results for its third fiscal quarter of 2015 on July 21, to be followed by a conference call potentially offering insight into the sales performance of the company's newest product category, the Apple Watch. Announced through its Apple's Investor Relations webpage, Apple's upcoming quarterly report and ensuing conference call will cover the three-month period spanning April to June. Quarter three is usually met with a lull in hardware sales, though last quarter's performance bucked the usual sequential sales slump posted after the holidays. For the last quarter, Apple beat Street estimates with $13.6 billion in profit on revenues of $58 billion driven by a record 61.17 million iPhone sales. Mac numbers were up 10 percent to 4.56 million unit sales, but iPad sales fell 23 percent year-over-year to 12.6 million units. Although it will be lumped together with iPods and Apple TVs, investors are looking Apple Watch performed over its first quarter of availability. The device is the first commercial product developed without the watchful eye of late cofounder Steve Jobs, and to some represents the efficacy of CEO Tim Cook. In its last quarterly statement, Apple offered revenue guidance between $46 billion and $48 billion, with gross margin set between 38.5 and 39.5 percent. At the time, the company warned margins might be down slightly due to economic headwinds, including foreign exchange rates. 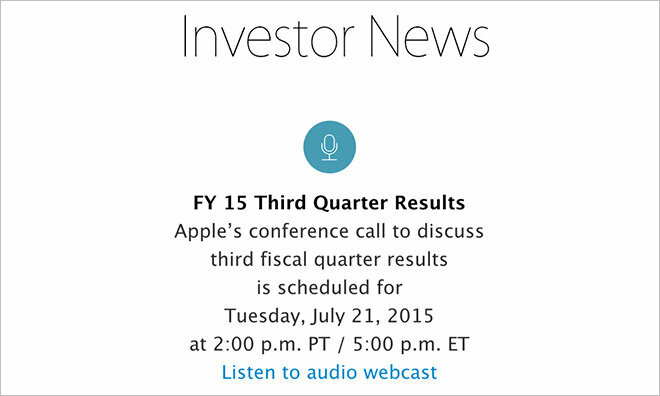 Apple's earnings conference call is scheduled for Tuesday, July 21 at 2 p.m. Pacific/5 p.m. Eastern. AppleInsider will provide live coverage of the event.